If there is no log file, restart the tbdbserver. Double-click the Toon Boom Harmony Control Panel icon. The Toon Boom Harmony Control Panel dialog box opens. From the Process Starter menu, select tbdbserver. 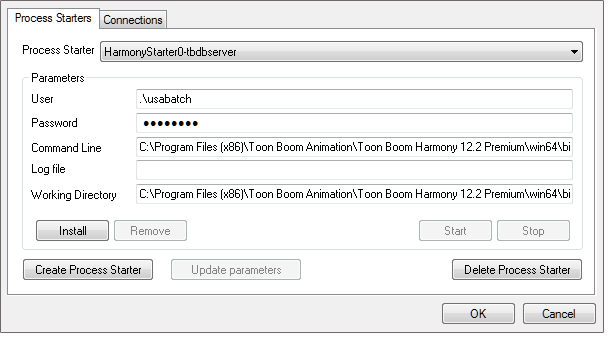 If you continue to have problems with the database server, locate the tbdbserver.log file and send it to store.toonboom.com/contact/support. This file is usually in C:\ProgramData\Toon Boom Animation\Toon Boom Harmony. NOTE: You can also run the Dbserver from the command shell in debug mode to receive additional information about the process. In the Harmony Control Panel, select tbdbserver from the Process Starter menu and click Stop. NOTE: While you are running the tbdbserver in debug mode, messages will be written to the shell for each operation the tbdbserver performs. This is in addition to the information written to the tbdbserver.log file. NOTE: If you still cannot determine the nature of the problem, send the file to store.toonboom.com/contact/support with a detailed description of the problem.